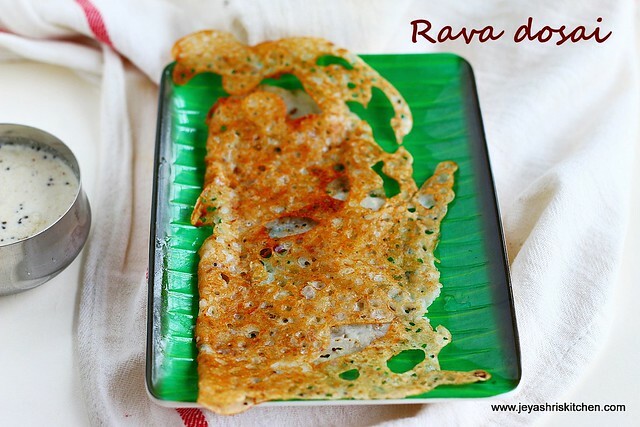 If you wonder on reading the title of the post, yes it is Rava dosa recipe only. 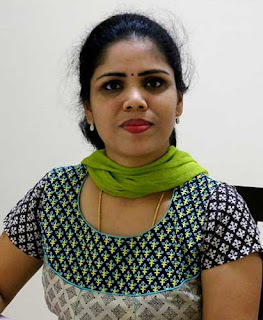 IT has been six years now i have been blogging but never posted this recipe of rava dosa in jeyashri's kitchen. Some how during my childhood days it was never made at my house. 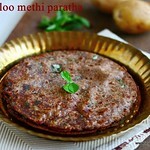 Whenever we go to eat out, my parents will order for Onion Rava Dosa and me and my sister will order Parrota. Always out neighbour aunty makes rava dosa and many times she either call us when she is making or send it to home too. So i always have the inhibition to try out this Rava dosa at home. 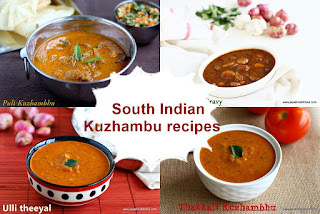 It has been a request from my readers for a very long time and finally i asked the recipe from that aunty, and got it perfect for the first time. Then i wondered why i was such reluctant to try this recipe at home and keep on postponing for a long time. 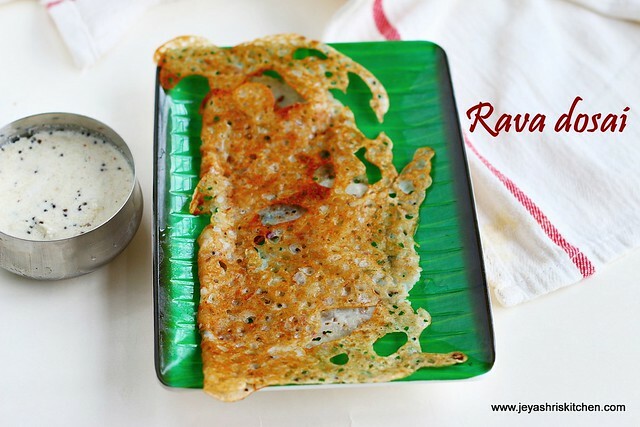 Now Rava dosa i make at home once a week and all of us are a big fan of crispy rava dosa. 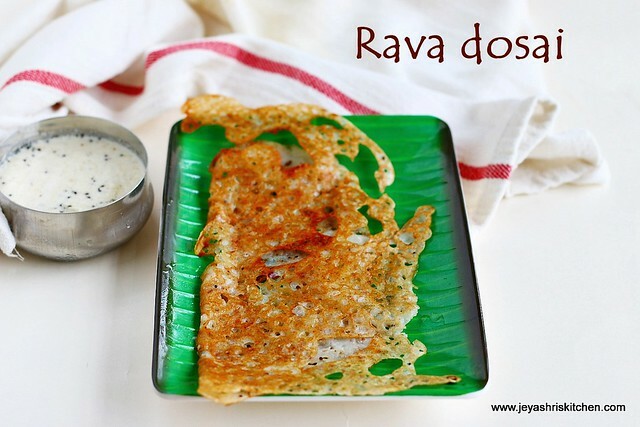 Try this rava dosa at home and let me know your feedback. 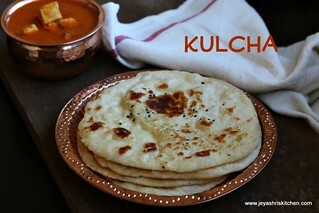 Check out my crsipy dosa recipe and Instant wheat flour dosa too. I halved the original recipe given by her. Sorry my dear readers for making this post very late. In a wide bowl add the rice flour, sooji and maida. No need to roast the rava. 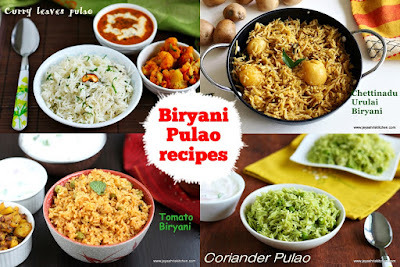 In a pan add 1 tsp of oil and throw in the mustard seeds, Add the finely chopped green chili, onions,whole pepper corns and curry leaves to this and cook till the onion turns pink. Do not let it brown. Switch off the flame and ad the cumin seeds. Add water to this and add salt. Mix well without any lumps. This batter should be like a thin buttermilk. So mix it very well. Even after making the dosa everytime, mix the batter well. Heat the non stick tawa and sprinkle little oil on it and spread it well. 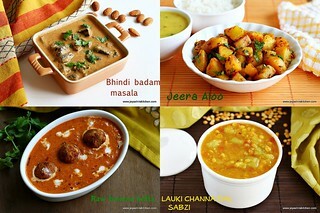 Let the tawa becomes hot. 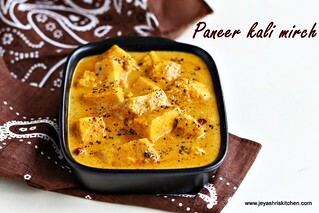 Take a ladle full of batter and sprinkle it on the tawa. Some people even used to sprinkle it with hands too. 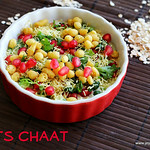 But i think it comes by practice.Add oil | ghee to the this. Let it cook and starts browning nicely. Keep the flame in medium . Generally rava dosa takes little more time to cook than normal dosa. Flip the dosa and cook for few seconds . Crispy rava dosa is ready to serve. 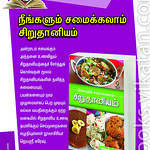 Serve hot with coconut chutney and tiffin sambar. Always ensure the batter should be thin. Keep mixing the batter well every time before making the dosa. Always ensure the pan is hot before making he dosa. You can skip onions and just add the seasoning to the dosa. Some people add little buttermilk to the batter too. You can add if you wish. No need to soak rava?? After making few Dosa, how long can I keep rest of the batter in the fridge? Week o.k.? i tried the recipe and it came out wonderfully. its easy to make and tastes really good. thanks for the recipe!